This golf club is in a large property development by Taylor Wimpey – a British property developer. So most of the surrounding property has been marketed to British people, and membership of the golf club itself is about 70% British. None of the property crowds on to any part of the golf course. There are simple but accurate concrete hole maps on every tee box. I describe Los Arqueros as moderately difficult. The course covers quite a large area and has plenty of space between holes. 13 of the holes have a good degree of elevation (along the fairway towards the green) or big dips in the fairway between the tees and the green. This is a very up-and-down course. Walking the course is possible, but fairly strenuous. The 8th hole (par 5, stroke index 1) stands out as exceptionally tough, and the two holes before it are also quite demanding. That makes a sort of miniature 'Amen Corner'. The remaining holes are not as difficult. Tee boxes perhaps a bit scruffy, but that is hardly important in my view. The rough on some holes along the valleys can be extremely tough, on other holes on flatter parts of the course the rough is not too bad. A lot of variety in the rough as with all aspects of the course. Every hole has simple, strong design - the difficulties on each hole are obvious. Greens are medium size, quite fast, often have strong contours and are genuinely tricky. This course has variable standards. Some times when I have played it, it has been green and well-watered. At other times, very dry with the grass on both the fairways and greens patchy and the greens in particular taking damage from pitch marks. In short, inconsistent maintenance. The bunkers I think are not quite up to the standard of similar-priced clubs on the Costa del Sol. The sand in those bunkers is more like dirt and the maintenance of the bunkers (e.g. how bunker lips are shaped, how the bunker is raked by machines) is indifferent. Los Arqueros is not really a course for very high-handicap players (30+ handicap). Just a little too tough for them e.g. carry for a tee-shot is not trivial. But handicaps up to 25 should find this course fair to play. Given the elevations on each hole, you ideally need to play it a few times to see what club you really need on fairway shots. First time out, just go up or down one or two clubs depending upon the elevation up/down of the hole as you see it in front of you. It is easy to be short of the greens on uphill holes and miss hitting the green in regulation. This is not criticism, it reflects good design. Buggies are allowed on most fairways. 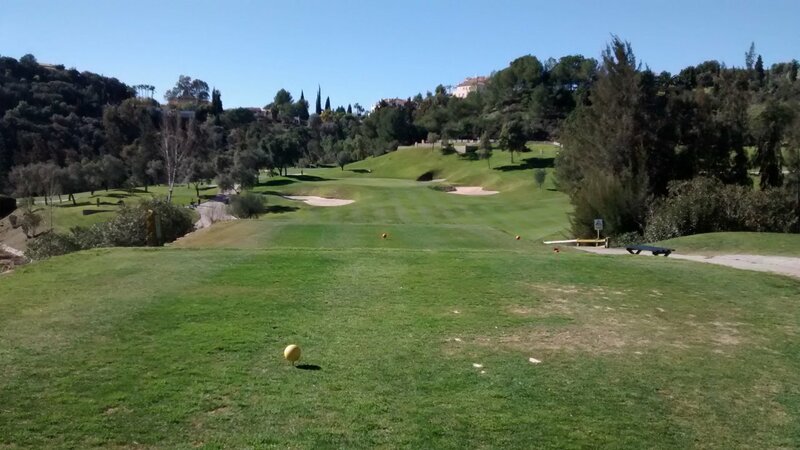 Not an expensive course and is probably among best value-for-money among medium-difficulty courses on the Costa del Sol. The staff I have always found pleasant. This is not a personal favourite course of mine, but really just for subjective reasons. Happy to go back there any time if someone suggests it. Los Arqueros targets a certain mid-level profile of golfer and expense and serves that level very well. Quite a busy club, with both active members and tour parties. Fairly large clubhouse with associated activities – lessons, driving range etc. 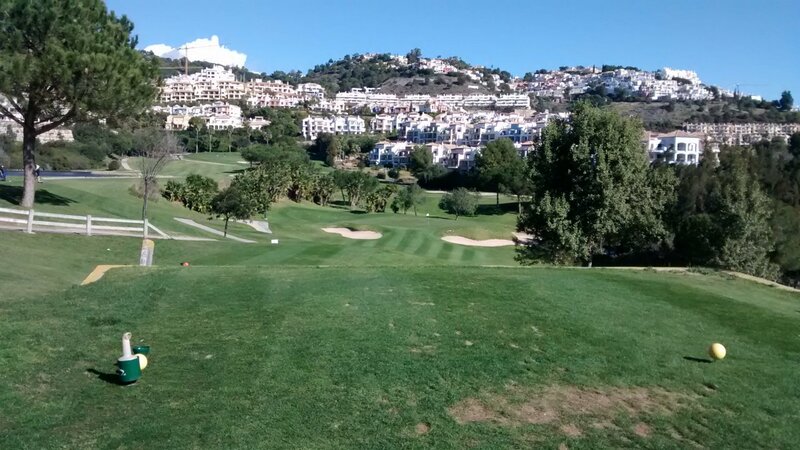 If you are the type of person who sits on the Costa del Sol and wants a fairly comprehensive self-contained 'club/lifestyle' experience at a nearby local club you play virtually all the time, then I can understand you would find the whole Los Arqueros experience pleasant. Not for me (I prefer playing lots of courses and am not really interested in a club social life), but that is just a matter of choice. Review last updated: February 2015. Number of times played: 6. Los Arqueros is the yellow dot. 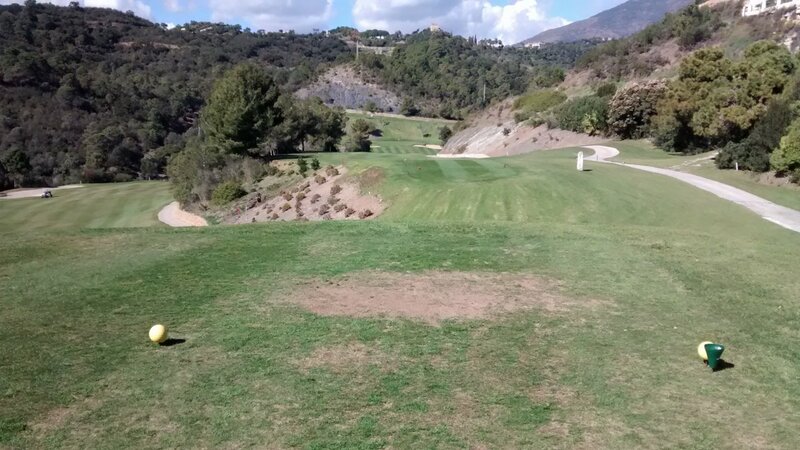 It is one of the shorter courses on the Costa del Sol. About 5300 meters off the Mens Yellow tees. Note that this course is a bit more difficult than most courses of comparable length - probably due to some up-and-down or narrow fairways in particular on holes 6/7/8. An 18-handicap player can expect to play this course at about 20 over par.